How to change social channels in an ongoing Marketing Plan? Steps to add social channels to a current marketing plan. 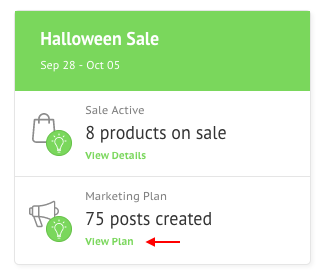 Go to the Marketing tab in your Socioh dashboard. 2. Choose the campaign type - Product Sale / Daily Deal / Coupon Code / Auto-Pilot. Click on View Plan and then Edit Marketing Plan. 3. Check the box next to the channel that you want to include. To stop posts for a particular social channel, click on Stop Marketing Plan next to it. And if you want to include a channel that's not connected, click on the Connect Now button next to it. Note: Don't forget to Re-create the Marketing Plan and Save your Plan once you're through making the edits.